Season. The team combined for a total of 19786.5 minutes played. We created the column Player Min / Total Min to measure the ratio of each player’s playing time to their total playing time. Then we multiplied that column by the PER column to calculate each player’s WPER. Finally, we sum over each player’s WPER in order to determine their total Team Efficiency Rating (TER). With this method, we calculated TER for each team and collected each team’s winning percentage in the regular season. Figure 2. 30 Teams’ Team Efficiency Rating (TER) and their winning percentage in 2014-2015 regular season. Next we’ll use linear regression to model the relationship between TER and winning percentage. As the graph demonstrates, the r-squared value is large – roughly 0.76 – meaning 76% of the variance of winning percentage can be explained by the change in TER. The graph and the regression line show a strong relationship between a team’s winning percentage and TER. 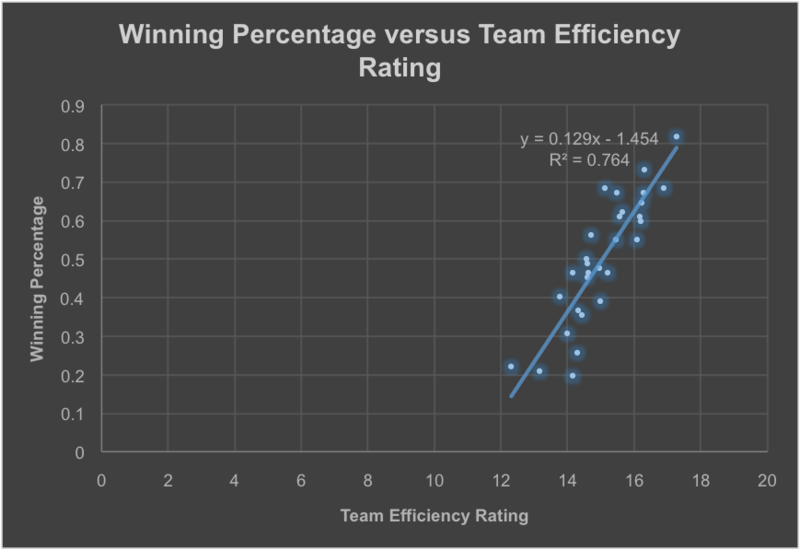 Therefore, the higher the Team Efficiency Rating, the more likely a team is going to win. This method allows us to view a player’s “true” contribution to a team’s victory. The model can help us identify some superstars who play many minutes, but whose inefficient performances actually hurt the team. This method allows us account for a player’s inability to contribute whenever he is injured or he doesn’t get a chance to play. The overall TER will decrease and thus negatively affect a team’s performance. We assume that a player’s PER is constant through both the regular season and playoffs. There are many other factors affecting a player’s performance such as pressure, emotions, and personal business. One player’s PER can be affected by another player’s PER because they may play particularly well in the presence of one another. These factors may affect each player’s PER and thus affect the overall TER. 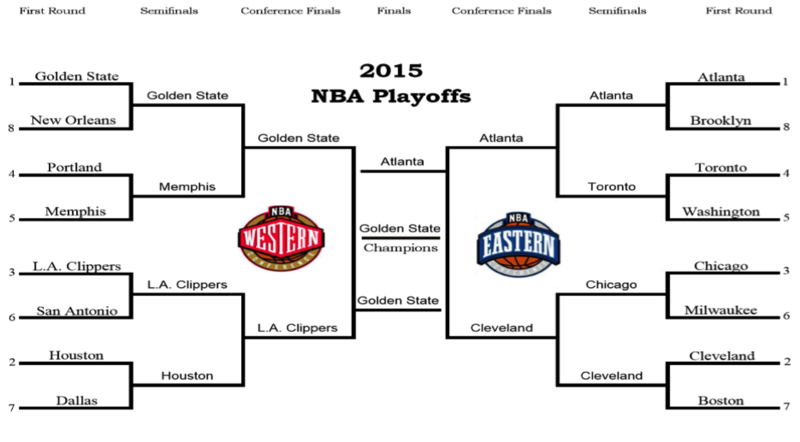 Overall, we got 12 of the 15 series correct, which is 80% accurate. Our confidence percentage is close to the r-squared value obtained earlier, which suggests that this method can accurately account for roughly 3/4 of all matchup victories. In this paper, we introduced the method of using Weighted Player Efficiency Ratings (WPER) to predict NBA playoff games. We collected Player Efficiency Rating (PER) data from ESPN and weighted it according to each player’s playing time. WPER tells us about the real contribution of a player to the team victory. The results show that there is a strong relationship between the sum of each player’s WPER and a team’s performance. This method helps us predict each team’s performance in playoffs based on the players’ contributions to the team in regular season with an accuracy around 76%. In the future, this model can be further modified by considering the factors that change Player Efficiency Rating (PER), such as pressure, emotions, and playing conditions.